Happy Easter weekend, fam! 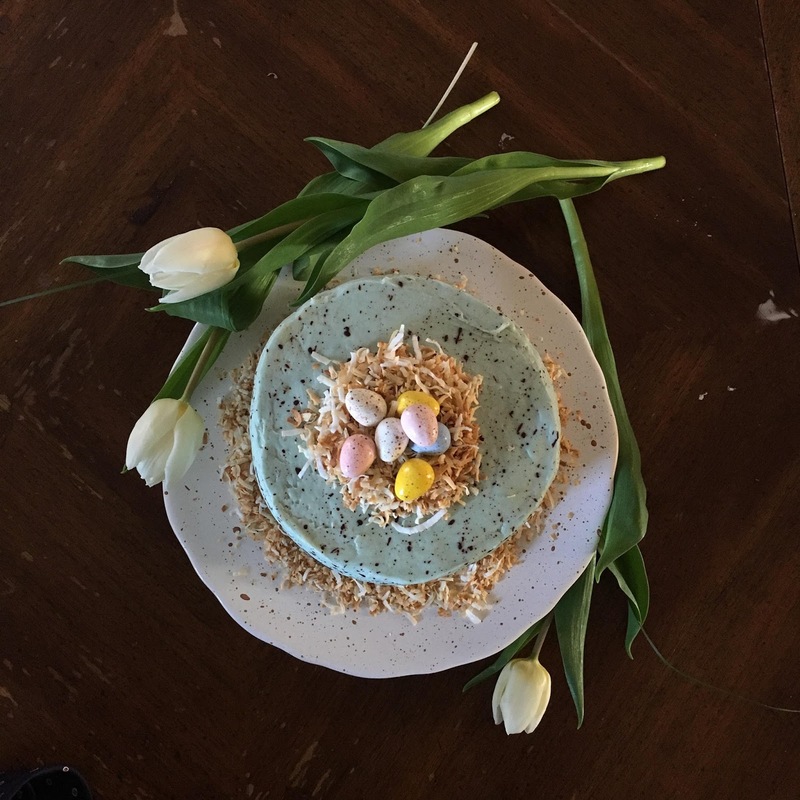 I thought that this robin's egg Easter cake was the perfect way to express my undying love for the first flush of spring. I always have these grand ideas that an iPhone photo will never ever show up on my blog at any point in time. My reasons are numerous: who wants to see an iPhone photo outside of Instagram? What brands want to work with bloggers who don't put in the effort for real photos? What readers are going to find an iPhone photo tempting enough to convince them to make the cake or even read the article? Despite all of these questions, I still do it occasionally for your sake. After posting a photo of it on Instagram, you all called for the recipe for a speckled, spackled, pretty little robin's egg-inspired cake. As I write this blog post, it's Thursday night - you've got only a few days to get on board this cake train and my pride can bend a little.Y'all know there would be real photos here if I had had a spare minute. Full disclosure: my grandmother's funeral was today and I didn't have the mental space to stage photos and try to get perfect shots of something I had created just out of the joy of creating. In that spirit - the spirit of spring, and beauty, and new life - I'm sharing the recipe and I hope you'll have as much fun making this pretty, pretty cake as I did. My version of the robin's egg Easter cake was inspired by photos from Preppy Kitchen. The pretty speckles on the cake (and on the eggs on top) are created by whisking cocoa powder with vanilla extract to form a thin paint. You dip a clean paintbrush into the "paint" and flick it against your smoothly-frosted cake. Basically Bob Ross it all the way till you're satisfied with the robin's egg effect. This looks super difficult and impressive but actually it's ridiculously easy. Like finger-painting easy. Promise. The sponge of this cake itself is this incredibly soft-but-sturdy white cake lightly flavored with almond extract. It isn't too sweet and it isn't too dry but it'll stand up to whatever you want to frost it with and that's just part of what makes it amazing. I'm having visions of this as a really pretty wedding cake. Anybody local getting married and need a cake? Trust the recipe when it tells you to add the butter into the dry ingredients rather than whipping it with sugar and eggs as you're probably used to doing when baking a cake - this out of order operation is called "reverse creaming" and really helps build the structure of the cake so trust me here! 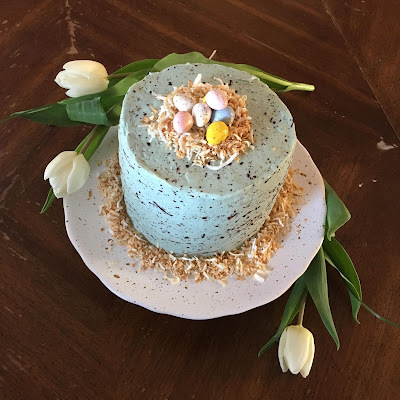 My recipe for the white almond cake is a barely-tweaked version of the recipe that Michelle from Hummingbird High used in her go at this Easter egg cake, only hers was lemon and mine is almond. As with many of the recent cakes around here, I chose to use Italian buttercream which I tinted blue and flavored with a little bit of almond extract. As you can use any sort of light frosting (vanilla, almond, lemon, etc.) for this recipe, I'm not including the recipe for my frosting. If you're really Type A about things like this, I used the frosting recipe from the Valentine's Day cake but skipped the tea-infusing step. You can make the same frosting I did or use your own favorite recipe - your choice! To keep with the egg theme and off-set the richness of the buttercream frosting we're going to slather the center of each layer with a thick schmear of lemon curd. Of course if you're Betty freakin' Crocker you can make homemade lemon curd. For the purposes of simplifying one step of this cool cake, I've instructed you to do as I did and buy a jar of tart lemon curd. Be sure to look for one that is made with lemon juice, sugar, butter, and eggs - none of that awful corn syrup-based jazz. Beyond this, a little bit of toasted, flaked coconut forms the nest and the eggs can be anything from jelly beans to those strangely delicious mini Cadbury eggs which somehow I'd never tasted before this year. How did I miss this my entire life? Are they an imported thing or something? Please let me know - I feel like somebody was lying to me this whole time. Center your rack in the oven and preheat it to 350 degrees F. Prepare 3 6-inch pans by greasing, then lining with parchment paper. Grease parchment paper and set aside. In a small bowl gently whisk together egg whites, 1/4 milk, and almond extract. In a bowl of a standing mixer fitted with paddle attachment, combine the sugar, cake flour, baking powder, and sea salt. Mix for 30 seconds on low speed to blend. Add 3/4 cups butter and 3/4 cups milk, mixing on low speed till ingredients are moistened before cranking speed up to medium and beating for 1 1/2 minutes to boost the cake's structure. Use a rubber spatula to scrape sides of mixer, then turn mixer to its lowest speed and add the egg white mixture in 3 batches, beating 20 seconds after each addition to continue to work the structure-magic. Scrape down the sides one final time and mix it together one last time by hand. Evenly divide into pans, tap each pan against counter to beat out air bubbles, then bake for 30-35 minutes until the top of each cake springs back when pressed lightly and a toothpick inserted into the center comes out clean. Cool in pans slightly, then turn onto rack to finish cooling completely before assembly. When ready to assemble cake, level all three cake layers. Spread lemon curd in center of first layer, then pipe a ring of icing all around the edge. Stack next layer and repeat with remaining layers. Frost outside and top with a crumb layer, then allow to sit in the fridge for 15 minutes or until frosting is set. Frost with a second, final layer of frosting and smooth with an off-set spatula dipped in very hot water. Flick cocoa "paint" against the cake and candy eggs until desired effect is achieved. Form coconut into a "nest" on top of cake and rest eggs inside nest. Use remaining coconut to form a border along the bottom of the cake. Happy Easter, friends! Amid all the fun celebrations, I'm celebrating the final victory of my Jesus over death and the grace His death and resurrection mean for me and for all of us. Hallelujah! That is a glorious cake! I pinned a version of this cake a while ago, and recently decide that I wanted that to be my Easter pretty dessert. I think the one I pinned was cheesecake, but I'm only want to do the same look. I have a vanilla cake recipe I love. I think I'm going to do chocolate ganache for the filling and use that to flick all over the cake. That's such a good idea, Livia! Let me know how it goes for you. GOTTA love chocolate. And as there are so many chocolate Easter-eggs, it fits well with the springtime theme! I think the cake could've been better, I think I skimped on the flour, my color reminded me of PlayDoh, my siblings teased me about the green nests (on Pinterest it was green, if I make again, I think I will do your way), and I need that icing scraper professionals use to keep icing to a minimum, but nevertheless, I was THRILLED with how it looked; I was so proud of myself. Everyone who tasted it loved it. Very yummy (not what I was most concerned about, I knew that would be the case, that is my first priority, and I already knew the cake recipe was good, and it is hard to go wrong with ganache).